Hi! I'm wavewhisker of riverclan! Part3 is the climatic scene of this series.I hope you enjoy this quiz! If you enjoy this quiz,try the others too. I will make a warrior cats love story only for toms after this. So look forward to it! This is a warrior cats love story. 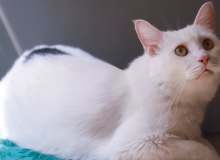 A she-cat named snowleg will choose either of the four toms, and become mates. Remember, it is all your choice to choose! Have fun! "Wolfpelt was saved,thanks to larkspin." The clan leader said to the other clanmates. Larkspin licked his chest embarrassly. The meeting ended, and you trotted down the hill to meet wolfpelt. "are you alright? "you asked. "I'm okay. Thanks for asking. "Wolfpelt replyed. "when do you get back to warrior duties?" You asked again. "tomorrow" "that's great!" "I can't wait to sleep in the warriors den! With you." Wolfpelt's face brightened. I want to sleep with you too! Wolfpelt! but I want to sleep with thornblaze! but I want to sleep with dolphinwave! but I want to sleep with mossjump! "I have to go to patrol. "you said to wolfpelt. "good luck!" "Thanks" you replyed and get outside the medicine den. As you got outside, dolphinwave came and talks to you. "may I go with you on the patrol?" "Sure"you answered. Yay! I can go on patrol with dolphinwave! I don't want to go on patrol. I want to stay in the medicine den with wolfpelt. The patrol headed to the windclan boarder. "Hey." Dolphinwave talked to you. "will you walk with me?" How do you answer him? "What is this smell? "you asked to dolphinwave. "I think it's a...badger!! Look out! Snowleg!!" Suddenly,you feel something pushed your body. It was dolphinwave! Dolphinwave attacked the badger bravely,but the badger was too strong. Soon dolphinwave was shaken off. "Run! Dolphinwave!" You shouted to him. Dolphinwave soon escaped from the sharp claws of the badger and ran towards you. Thornblaze! He is strong enough to save us! Mossjump! He will help us! Wolfpelt will protect us if he were here. the badger didn't attack the patrol. It turned away and headed for the camp. "oh no, the badger is heading for the camp! Come on, dolphinwave,we have to get there before him!" Dolphinwave ran and get in front of you and start running. Aww, dolphinwave is protecting me. you don't have to protect me,dolphinwave. I want to be protected by other toms. When you and the rest of the patrol got back to camp,the badger already started attacking the camp. Snowleg started clawing the badger's face. Dolphinwave joined you,clawing the badger's leg. Thunderclan warriors emerged from the dens,and started attacking the badger. You saw mossjump and thornblaze, and they saw you.they came straight to you, and said,"are you alright?" Suddenly,a badger turned around and charged towards you."no!" Wolfpelt shouted, and jumped between you and the badger."wolfpelt!!" You shouted. I...I love you. Wait for me in starclan. You were the bravest warrior in thunderclan. If you asked that you love him,continue.Wolfpelt's face brightened a little, but his face fall down on the ground."wolfpelt!wolfpelt! "you yelled,but he didn't reply. "I will see you in starclan. "you suddenly heard a voice calling for you. The badger was still attacking the camp. Mossjump came,and said to you. "I think I found the solution to this problem. Come on!" You followed mossjump to a big tree. "I think we can attack the badger from up here. I and thornblaze thought of it. What do you think?" I think this plan will work! "Let's get this plan started! "you said, and started climbing the tree.other warriors noticed snowleg, and also started climbing the tree. But suddenly, you lost your footing and lost your balance. Thornblaze supported you and you regain your balance. The quiz is over! How was it?